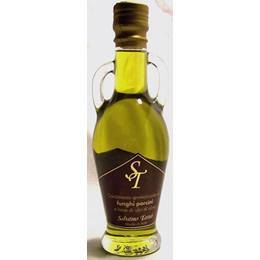 This 8.4 oz bottle of porcini infused olive oil is from Sabatino Tartufi. After a lot of research, we found this to be the best that we have ever used. Imported from Italy. Recommended uses: the basic ingredient is, of course, Sabatinos excellent olive oil processed according to the old traditional methods, enveloping the most intense aromas of the porcini mushroom. The Special taste of the mushroom flavored oil gives its best results with first courses or main courses.